You may not expect that shiny new RV sitting on a dealer’s lot to turn into a lemon. But if it does, as long as you have this phrase hand-written on your sales contract, you might have protection under the law. Aside from RV inspections, those nine words are one of the best ways to protect your rights when buying from RV dealers, according to lemon law activist and lawyer Ron Burdge. That phrase may give what you want from the dealer, should things go wrong later on down the road. “It gives you that 24-hour warranty,” explained Burdge in a recent RV Show USA podcast. But that’s not all, he said. With those words added in writing to any standard contract, the federal consumer protection act known as the Magnuson–Moss Warranty Act will kick in. This automatically gives the buyer an “implied warranty of merchantability” that may be good for as long as four years in most states. Hand-written words on a contract may seem like a gamble, but Burdge went on to explain that legally, any hand-written phrase written on a contract by the seller will over-ride any pre-printed words – like the ones that proclaim that a dealer isn’t giving the buyer a warranty. With the nine words added to your contract at closing time, you automatically get a warranty under the federal consumer law. That warranty may often be better than the RV lemon law protection offered by your state. 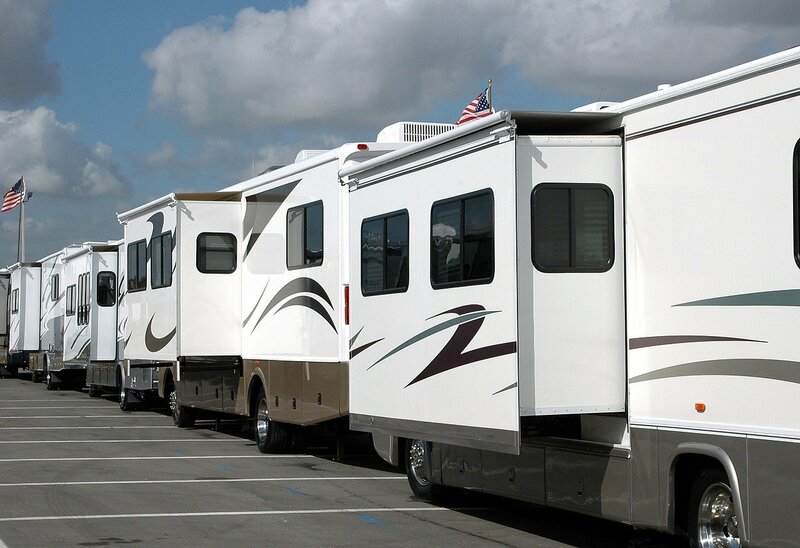 “If you want to get a quality RV that someone is going to stand behind, then you need to make sure your legal rights are set up so that they have to,” the Dayton, Ohio lawyer explained in this podcast. Every U.S. state has some type of lemon law. Some of them are better for consumers than others. But when it comes to RVs, most of these lemon laws don’t cover anything other than a RV’s engine and chassis. Even worse, most states exclude towable RVs from protection. But if you suspect you bought a lemon RV, don’t despair. The federal Unfair and Deceptive Acts and Practices (UDAP) statutes apply to all states, Burdge explained. These protections can act in the RV buyer’s favor in states with deficient RV lemon laws. UDAP statues offer protection for any consumer product. This entitles the buyer to a full refund or repairs on the failed product. Use different communications methods to contact the dealer. Reach out on the telephone, send written letters by certified U.S. mail, private courier and email. Alternate methods and do this daily and consistently until you receive an adequate response. Keep a log of your interaction with the dealer. “Keep a diary of what’s going on. So that when you talk to somebody on the phone from the factory or from the dealer, you make a note of what they’re saying and what you are saying. So you have a record of what’s really happening,” says Burdge. Contact your state attorney general’s consumer protection division. At best, you will receive a copy of the letter they send to the dealer, asking for an explanation of why they are not complying with your requests. It’s that response which will help you understand how to argue the case. Be firm, but don’t be a jerk. Let the dealer know you aren’t going away, but be calm and reasonable with your language. Finally, avoid using the phrase “attorney” until you are absolutely certain that you are not making progress with your case. Know for sure that you have an attorney who agrees to represent you. Otherwise, you risk cutting off communications with the dealer. 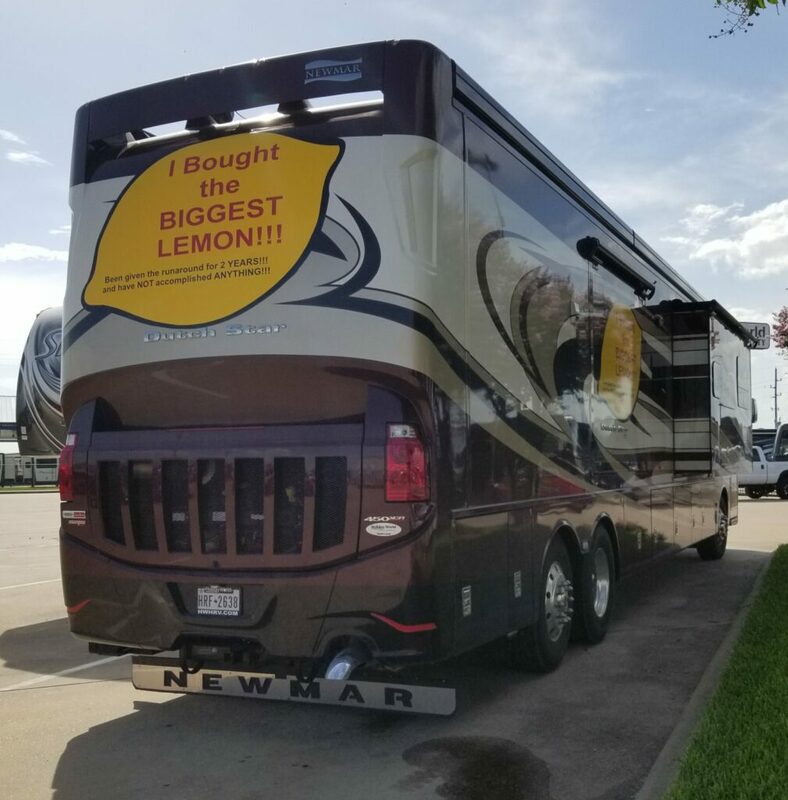 Do you have a RV lemon horror story to share? We want to hear about it. Let us know more details in the comments below. Just so I understand… you are saying that I have to convince the dealer to write those words onto the pre-printed contract? It does not work if I write them myself? I’m not a lawyer, but I’m sure written by buyer wouldn’t work. The buyer might agree to it, but it doesn’t mean the seller agreed to it and the seller could claim it was written later. I’d be having the seller or representative sign after the statement as well. I am trying to figure out how 24 hours translates to 4 years. You can write it on the contract before it is signed. The dealer would have to initial the change and then you both sign the contract. Our second RV purchase was from the same dealer as the first. This time we purchased a brand new, never pre-owned class A Fleetwood Revolution 40′ 2006 with 400 Cat HP. Our first trip out we drove from San Antonio, Texas to Seattle, Wa with no problem. On the return trip the engine lights came on and 5 seconds later the RV simply shut down while driving down the highway near Salt Lake City. Luckily we were able to coast off the highway at the next exit to nowhere. Had it towed to the nearest repair shop and was told it needed a new engine. Had to then towed it to Salt Lake bigger shop where they put a new engine in. Two weeks later getting ready to pick it up was told it needed another engine because metal shavings had gotten into the new one. It took over a month, stranded in Salt Lake until we were able to drive it home. It has never been the same as it was when we first took off. Many other items were breaking down. Tried the lemon law and was told Fleetwood was going through bankruptcy so we could not make any kind of claim. They never made it right with us. The value of the brand new RV was permanently lowered substantially from which we will never recover. Door lock wouldn’t work, had to grind out bigger hole in door jamb. Later, had to replace the keyboard for the electronic door lock. Wipes on slides do not go out when slide is opened. Have to push them with stick to go out. Gulfstream couldn’t tell me how to sanitize the potable water tank. Numerous trim pieces had to be re-secured inside trailer. Can’t adjust air flow to burner on stove, best answer, let it burn with yellow flame. Ceiling fan/vent had water leaks. Trailer running lights on back had water leaks. One side window had a water leak. Roof leak over the front closet. I had to caulk all of these places since these problems showed while we were out of town. Found staples above refrigerator slide were scraping the roof on the slide, digging a groove in the roof material. Had to have them cut or removed, dealer did the work. Electric heating on hot water didn’t work, needed a thermostat. Shower had numerous leaks around base. Water leaks into basement from shower. Laminate siding on bathroom door is pulling away from door frame. Bolt on crossbar of mechanism that puts trailer feet up and down sheared off. Venetian blind by kitchen sink had to be replaced. Second slide scrapes across the linoleum. Pin holding side support to steps fell out; shortly thereafter another pin fell out. Carpet edge was tearing away from carpet. The material covering the lounge chairs is cracking. None of the waste tank indicators works correctly. Dealer had to replace black tank, a 2 inch screw from the flooring was screwed into the tank. Dealer’s repairman found shop towels in black tank after draining it. Water safety electric outlet had to be replaced, lost one electric circuit. Both sink faucets had to be replaced. Awning and awning motor had to be replaced. Currently replacing a slide wipe that is tearing. Currently trying to get the factory to fix a manufacturing defect: Found out nose insulation was not installed all the way to the roof. Bedroom gets hot when sun shines on it and have had to use a lot of heat to keep the bedroom warm when it’s cold outside. This has reduced advertised R-14 insulation to about R-1. Tire rims on trailer were rated for 3200 lbs, should be rated for 3500 lbs for a 14,000 lb gross trailer. I’d like to know the answer to Kevin James question also. There should a better law that protects the multiple thousands of us that regret our purchase once we have signed the dotted line and drove it or pulled it off the lot. We are at their mercy and that’s where quality in any shape or form becomes a nightmare. It took all our excitement and plans of our quality time to enjoy away and is wearing us out. Although our hard earn money is still paying for it. I wish they were held accountable for the quality of their stock and their service. Oh boy, you are going to get an ear full on this topic. I bought a THOR Axis, I had three pages of things wrong with it. They ranged from funny, to concerning, to dangerous. Funny was a shower bracket for the shower curtain. that was mounted upside down. Concerning was the awning UP/DOWN rocker switch that was wired backwards so the DOWN position rolled the awning UP and vice versa. The dangerous example was a self-tapping screw that was blindly drilled through the battery box and hit the battery cable on the backside of the case. The screw went through most of the insulation so it was a time=bomb waiting to happen as a full battery short and potential fire. I have been making these corrections myself because if the factory was this careless how bad must the dealer maintenance be? Just to get this off my chest I will tell you one more example. The official THOR Owners Manual says that the way to access the chassis battery is by sawing a hole through the dash. (page 99). The mechanic (not the dealer) said he would be happy to sell me a battery and install the battery, BUT he would NOT saw a hole through the dash! In franchising, most contracts state, “this contract may not be modified unless it is in writing and done by and signed by the company CEO.” (That’s a paraphrase, but you get the gist). I’m betting RV contracts have the same or similar clause. It keeps a low level employee from changing the intent of the original contract. Nice try though. BIG mistake buying RV. The problem is not with any brand or dealership … the corruption and unethical behavior is widespread. When will politicians take action to protect consumers who are routinely ripped off by the RV industry. RUN, don’t walk, away from purchasing these poorly made PIECES OF CRAP. I think Lemon Laws are very important. We must protect lemons at all costs. I would expect the dealer or REP to test drive it and run it throu its passes . hook up every thing and use it on them .. I all so would find a RV camp sight nearby stay there for a week this way you are not out of town yet …..
i bought a Used 5th wheel from Pet’s up in VT this was a used unit. my landing gear crapped out 5mi away wair i took it to test it out ……. they payed for the parts and then some..
this was a used trailer…..
i would think that a dealer that sell’s HIGH END RV’S WOULD BE MORE likely to take care of there people .